Check with your department regarding the structure of your text. The following website from the University of Richmond provides information about writing in different disciplines. A well-written text has an organized structure. By using words and sentences that signal how the text should be read, called signposting, one can clearly guide the reader through the text. This is a somewhat humorous tutorial about the very serious subject of plagiarism. The tutorial contains a quiz and provides feedback. This is a tutorial that you watch and listen to so make sure you have the sound on. The University Library's links to the Harvard and Oxford systems. This resource can help with different types of writing at the university level. There is information on, for example, establishing arguments, writing essays, conciseness, using appropriate language, active and passive voice and e-mail etiquette. This writer's handbook can provide you with help on: stages of the writing process, common types of writing assignments, grammar and punctuation, improving your writing style and citing references in your paper. This resource explains what academic writing is, such as, writing objectively, writing concisely, 1st person vs. 3rd person, inclusive language, and an academic writing e-book. The title of the book is Academic Writing: A Guide to Tertiary Level Writing. It is downloadable as a PDF version. This website from the Writing Center at University of North Carolina covers topics, such as, writing the paper, citation, style and sentence level concerns, specific writing assignments/contexts and writing for specific fields. This resource provides different writing guides for the writing process (preparing to write, conducting research, revising and editing) as well as writing genres (scholarly writing, business writing, science writing, writing in engineering). This website from Monash University, Australia provides tutorials for writing. There is general writing information and writing for different subjects, such as, Art and Design, Business and Economics, Medicine and Science. This website from the Finnish Virtual University includes information about cohesion, grammar, punctuation and style. Each section has an exercise(s) for you to work through. This website from Texas A&M University Writing Center covers different aspects of academic writing. There are even a few video presentations to watch regarding different topics. This is a link to a book in PDF format. The guide takes you through the entire writing process, from how to plan your time to how to develop your argument. There are many helpful pictures, figures and examples included in the text. A guide to writing that is pleasant to read. This website from the University of Manchester, UK is divided into 12 units and addresses how to write in an academic style and how to prepare your thesis. There is also tutorial material available to download with each unit. The information is aimed at postgraduate researchers in the Humanities. This website provides you with some general writing help. There is information about free writing, punctuation, six problem areas (subject-verb agreement, pronoun-antecedent agreement, pronoun reference, shift in tense, shift in person and misrelated modifier), basic sentence concepts and choosing your subject. This webpage from the University of New South Wales, Australia is a guide to writing lab reports for students in undergraduate science, technology and engineering subjects. It is also available in a PDF version. This webpage from Monash University, Australia provides a link to a guideline for preparing a science poster and some samples as well as a link for tips and tricks for creating an effective poster. This webpage from Texas A&M University, USA includes information about creating posters for conferences. It covers audience, organization, layout, text, color, graphics and other tips. This PDF covers planning the poster, scientific content, design, text, lettering, mounting, packing and displaying the poster. This is an electronic grammar course from the University of Ottawa, Canada. It covers topics, such as, building sentences, building phrases, building paragraphs and punctuation. In each section each grammatical term is linked to its definition. The website offers help with grammar on the sentence level, paragraph level and the essay and research paper level. 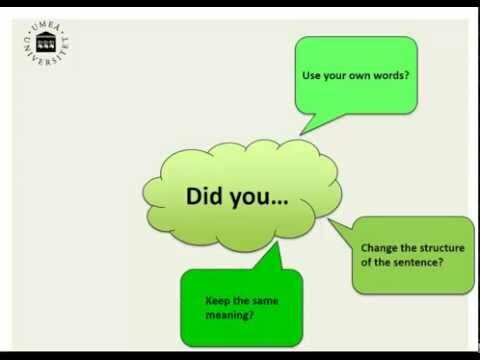 There are also Power Point presentations on grammar and writing that you can download. This website from the University of Toronto, Canada is geared towards to those who have English as a second language and need grammar help. This website from the University of Ottawa, Canada provides documents to help address common errors. They include: the essentials of grammar, articles, transition words, punctuation, which and that, adjectives and adverbs, gerunds, conjunctions, capitalization, sentence structure and verb tenses. This is a resource for academic writers. It provides common phrases used in academic writing. The phrases are organized into the following categories: Introducing work, Referring to the literature, Being critical, Describing methods, Reporting results, Discussing findings, Writing conclusions, General functions. This webpage provides you with the most common words used in academic writing. It gives the headword, other words in the family and a link to the definition. Helps students to learn words related to their field of study, for example, Business and Economics, Engineering, Law and Social Work. It also includes a section on Idiomatic English. You can register for free and create your own login and password to keep track of your scores. The index lists in alphabetical order different terms and parts of academic writing. Each term provides an explanation and example(s). The website also has information about paragraphs, style, evidence and language. This website is a guide for students in higher education. It has information about: Accuracy, Assessment, Background, Links, Listening, Materials, Reading, Speaking, Vocabulary and Writing. These are general introductory workshops geared towards students who are or will be writing a bachelor or master thesis. Workshops must be signed up for in advance and space is limited to 15 students/workshop. Students can attend one, several or all of the workshops. Once you have signed up for the workshop, you will receive a confirmation e-mail. Registration is binding. Students must be prepared to bring and work with their own material in the workshops. Activities in the workshops will be carried out as a whole group, in small groups/pairs, or individually. Learn more about for example, the writing process, presentation technique or time management.